Whisky Club Luxembourg collects 3260 € in 2017 for the Televie Luxembourg. Founded in 2007, the Whisky Club Luxembourg is dedicated to promoting Luxembourg's Whisky scene in a variety of ways. Our legendary Whisky Dinners are always a great way to spend an excellent evening among fellow connoisseurs or those who want to educate themselves in Whisky. Do you doubt that many establishments in Luxembourg can serve a Whisky the way it is supposed to be served? 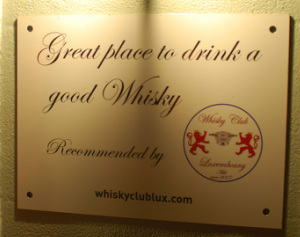 This sign guarantees that this is a good place to drink a good Whisky.